Neville Pilven’s work is represented in several corporate collections, as well as private collections in Australia, Britain and the USA. Neville Pilven was born in Melbourne in 1939. He studied at the National Art Gallery School from 1959 to 1961. 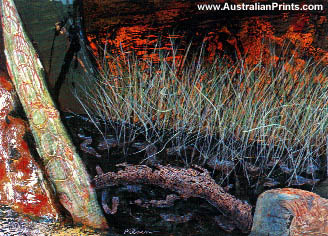 During the 1960s and 1970s Neville travelled to Europe where he painted and studied, and in 1973 he returned to Australia, establishing a home Studio at Alphington, Melbourne. 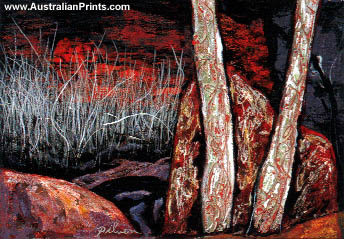 Pilven has drawn his inspiration principally from Kakadu and the Grampians, his work displaying a primeval perspective of the Australian landscape and a unique presentation of its waterways and rock formations. Pilven’s work has featured in several solo exhibitions in London, Melbourne and Richmond, as well as group exhibitions. His work is represented in several corporate collections, as well as private collections in Australia, Britain and the USA. Artist information page for Neville Pilven.